Are you opening your online store? Do you already have one and are looking to change platforms? 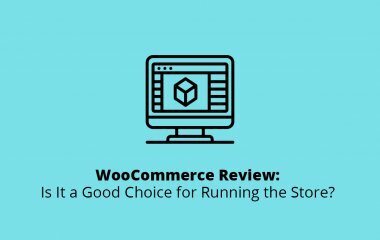 Well, we know that one of the most important decisions you have to make is choosing your eCommerce platform. If you aren’t happy with your current platform, or if you’re new to eCommerce and you’re looking for one, then you’re in luck. 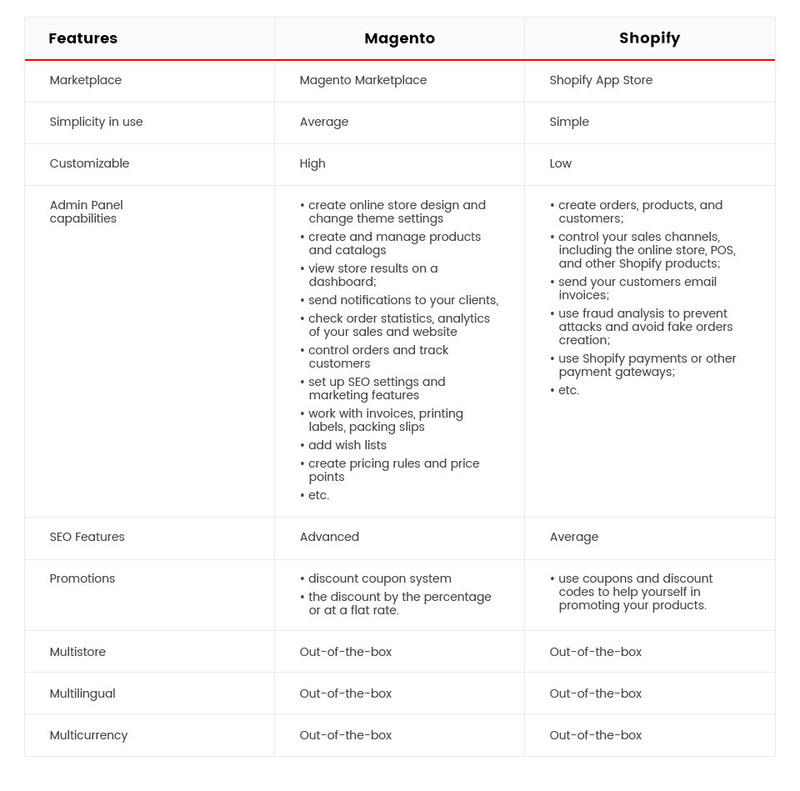 Below, you can read about the battle of Magento® vs Shopify, decide which one is the best eCommerce platform 2018, and learn what you should expect from either platform in the future. 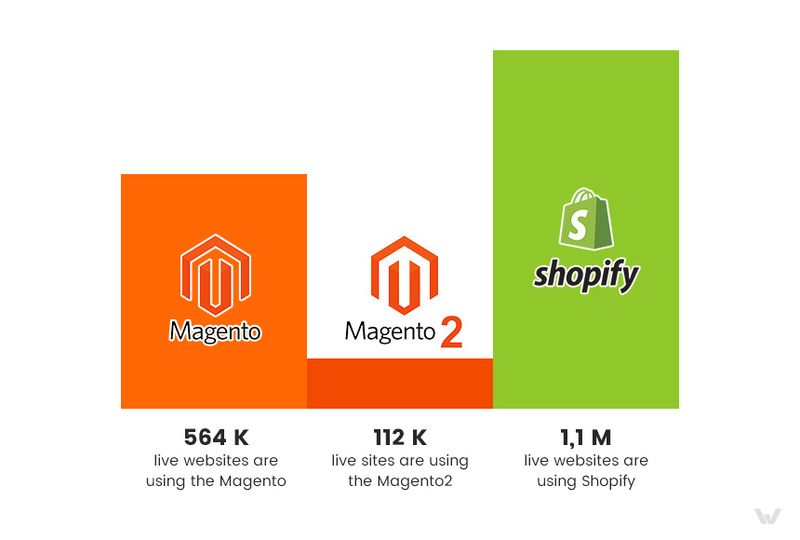 No matter where you look, you’ll find that Magento and Shopify are two of the most significant competitors in eCommerce. Even before the company released Magento 2, it was known for both its popularity and its quality. Now, though, its reputation is only expected to rise. Shopify also has a strong reputation among small business owners for its simplicity for setting up the store, as its data is stored on a Cloud. 564 K live websites are using the Magento. 112 K live sites are using Magento 2. 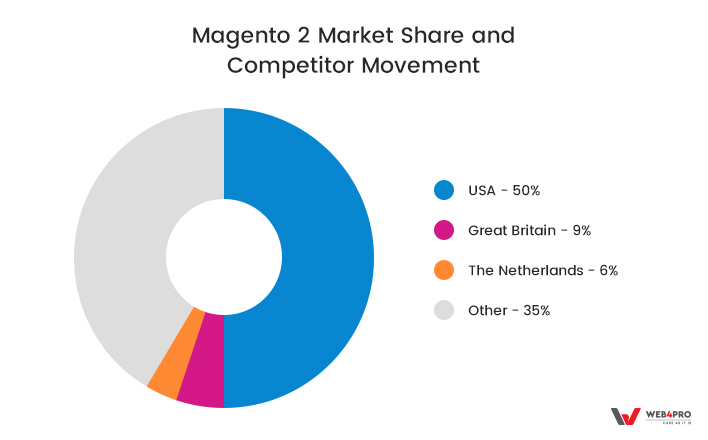 If we talk about the market share, 50% of the global market lies in the USA and 9% in Great Britain for Magento 2. 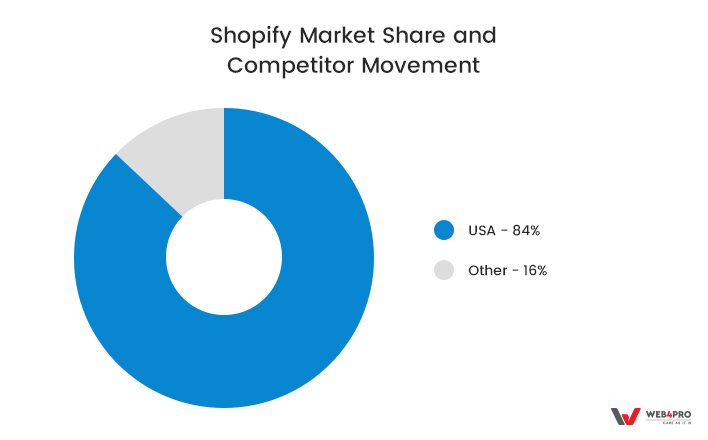 For Shopify, 84% of the market lies in the United States, and 16% – in other countries. Magento 2 is a powerful and scalable solution for midsize and big businesses among other eCommerce technologies. It is trusted by the big amount of merchants worldwide and provide extended functionality for different needs. Shopify is a SAAS and cloud-based so all the information is hosted on the cloud. The platform has different products useful for merchants as POS system, payments and the ability to integrate your store with ERP or CRM through open API. Of course, pricing might come into play regarding which platform you choose. Shopify works as a monthly subscription, with the first month free, so you have free access to all Shopify software as long as you pay your monthly fee. When you work with Shopify, you’ll also be expected to pay fees for any payments that are made through external gateways, which are web pages that redirect you to purchase outside of the host websites. For Paypal, Braintree, or other forms of payment, you’ll pay a certain fee percentage. 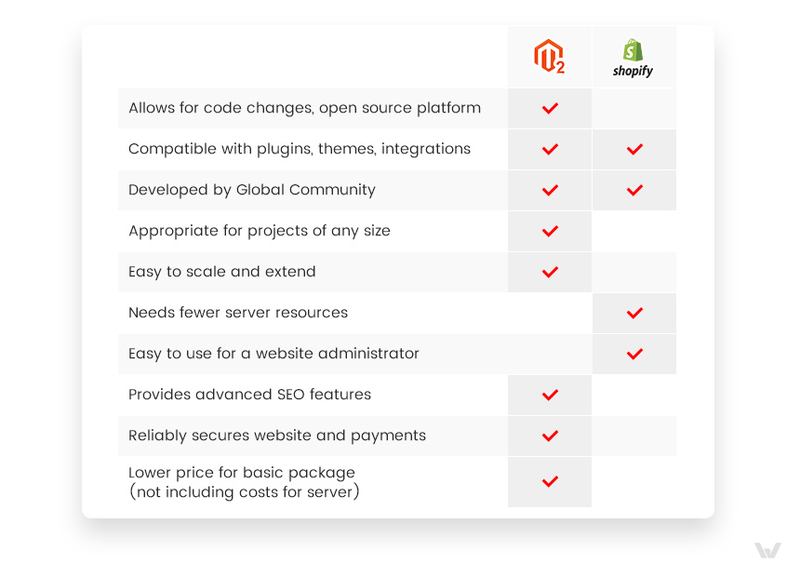 In comparison, Magento customers can use the same features as Shopify for less money every year. You can choose free or paid extensions from the Magento Marketplace. Shopify provides specific features with each package, and with Magento, you can select any feature you want, but the price may vary. An abandoned cart recovery, for example, comes freely with Shopify when customers go with the more expensive packages; however, Magento users can buy this feature for $39 yearly or find a free extension. Magento allows customers to choose their hosting solution at a price that suits them. With this platform, hosting can range anywhere from four dollars to over $100. Here we will highlight everything related to the main features of the Shopify and Magento 2 online stores. In Magento 2 admin panel, you can create your store look, check order statistics and analytics of your sales and other data, send notifications to your clients, work with products and orders, etc. The same for Shopify, you can see the core fields of your store as orders, products, and customers. You can control your sales channels, including the online store, POS, and other Shopify products if you use them. It will show your current sales amount, customer’s orders list, search terms and other analytical data to analyze your revenue and expenses on your Magento store. The dashboard in Shopify is called Home and includes all information about the store’s recent activity, order management and tips for your business. With Shopify, you can have over 100 gateways, including PayPal, Sage Payments, 2Checkout, and Authorize.net. But it isn’t out-of-the-box, and you need to pay additional transaction fees. However, Shopify has its own solution called Shopify payments. You won’t have transaction fees with it as well as reduced card fees. It is available for business owners from the US, Canada, the UK, Australia, Puerto Rico, Singapore, New Zealand, and Ireland. As for Magento 2 payment methods, it includes PayPal, Braintree by default and for the rest you need add-ons. To extend purchasing features, you can add tax rates to the payment that may vary from the customer’s type (i.e., wholesale vs. retailer). In addition to it you can set up price rules, but this is a customization feature that could be implemented with code. To allow customers to use their certificates and vouchers you can use zero subtotal feature. Shopify provides various carriers. However, you need to check their rules regarding pricing for different shipping methods, printing labels, weight, and package. To add choice, you can set exact shipping costs, flat rate, free shipping, and automatic shipping rates options. There is also Shopify product called Shopify Shipping available for stores based in the US (USPS, DHL Express, and UPS) and Canada (Canada Post). For Magento 2 you can use UPS, USPS, Royal Mail, DHL, and FedEx by default. For the user’s convenience, set up a free shipping, flat rate, and table tax rates. Both Shopify and Magento offer responsive themes that work on mobile and computer screens. Whether you’re on your phone, tablet, or computer, your site will look its best. Shopify users can change their fonts and colors, but they can’t do much outside of this because their themes are proprietary. Like we said before, Magento is open source; therefore, its users can change themes, fonts, colors, and much more. Plus, the upgrade to Magento 2 will allow users to edit through a drag and drop visual editing tool. If you are a non-coder, then this is especially useful. If, however, you want your online store to be to-the-point and functional, then Shopify should suit you finely. Regarding the development, both platforms share the same goal, they use very different practices regarding their code; for example, Magento uses PHP and Shopify uses Liquid. 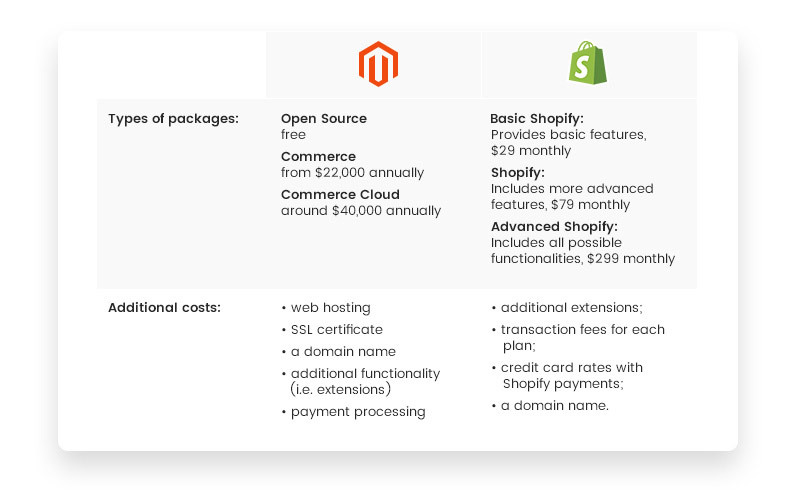 Also, Magento is an open source solution, unlike Shopify. Magento’s open source code means that the system and template are available to edit and to be modified. Shopify, on the other hand, has a proprietary source code, which means that you can’t have it changed. Technologies PHP 7.0.2, 7.0.4, 7.0.6–7.0.x and 7.1.x. MySQL 5.6, 5.7. Since out-of-box software may not be enough for your online store, so you should be aware that getting add-ons will require the work (and extra cost) of a developer to help run your store. When it comes a final choice between Magento vs. Shopify, Magento wins this category if we take into consideration its flexibility! Shopify is built on Liquid. As it is a platform on the cloud, you need to have hosting, a domain name, and SSL certificate. However, hosting is included in any Shopify package, unless you want the specific one. The same with a domain name, you can own yours or purchase it through Shopify. Magento 2 has a strong security update. New Signifyd tool for the protection of the store provides a high level of security along with modules for order protection and password management. With the CAPTCHA you will prevent fake logins creation. A for Shopify, it takes care of security issues, unlike a self-hosted website. Shopify meets all 6 categories of PCI standards for organizations that handle credit card and debit card information. Shopify online stores are automatically PCI compliant with 1st Level of PCI DSS compliant certification. As for Magento, you can always count on Magento Help Center and different forums, blog posts from contributors and developers to solve the issues you have with a store. Shopify provides 24/7 support and you can reach the team through phone support, online live chat or email. For the rest information, check Shopify Community with all the sources available from learning to solving the problems with your site. Magento allows you to request the Demo from their official website and experience working with Magento Admin. 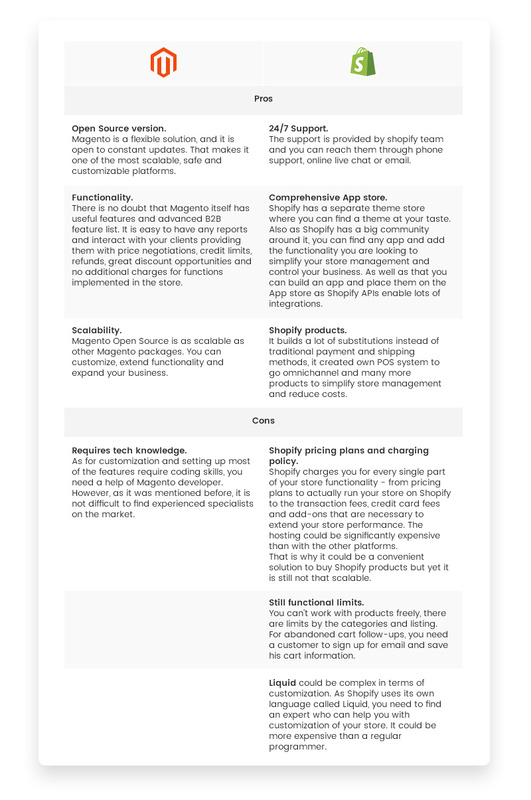 We also prepared the Magento Demo overview if you want to check the functionality before to try it out. Magento is consistent with the updates, and you can always check what is improved in the recent release via Devdocs. Shopify will guide you through the Demo via the Admin overview for desktop and mobile devices. Also, you can choose 14 days free trial to learn more about Shopify store features. As we’ve learned all about two platforms, let’s conclude the information with the pros and cons of Magento and Shopify. 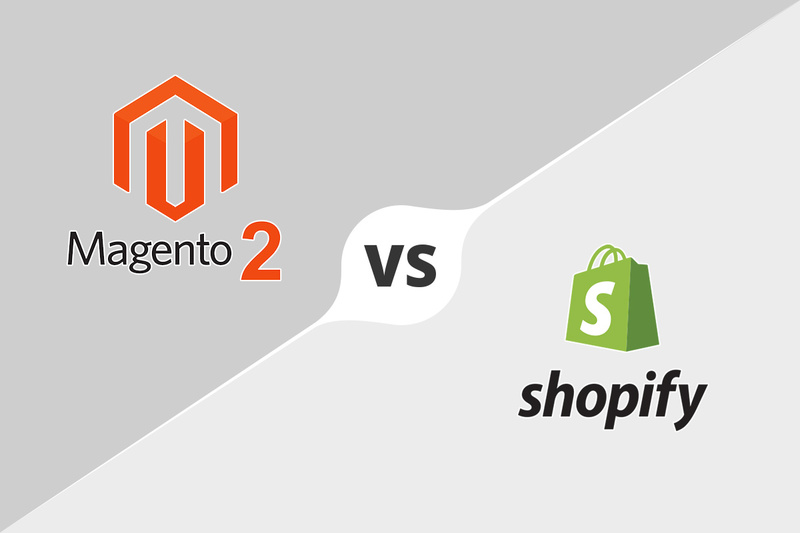 Magento 2 or Shopify: Which is Better for You? Magento 2 is better for people who are looking to expand their business and for people who need more flexibility. Not only this, but Magento has thousands of add-ons and extensions, some of which you can get for free. The admin can provide his or her customers with coupon codes, wishlists, and more through the use of these add-ons. Shopify, on the other hand, only has around 100 add-ons. Because of the coding alone, Shopify is suitable for small and midsize businesses; however, may not be best for more complex companies because bigger companies may need to change their source code more often. Even checkout and loading speed has changed with Magento 2; reports show that some sites perform more than fifty percent better than before, which is primarily appreciated because customers have described the platform as being slow in the past. The new launch, however, seems to make Magento and Shopify even. Finally, let’s compare these two platforms using the infographics below. To have control over every aspect of your business, you should also be going with Magento 2 because you can operate many websites from the same admin screen. Because Magento is so customizable, you might find it harder to operate than Shopify, which is why many people find Shopify to be better. After you sign up for Shopify platform, you can set up immediately. It’s safe to say that Magento has become much more user-friendly with the Magento 2 launch. Users can easily access payment processors, product management, advanced reports, etc. Magento serves different businesses and proves to be a scalable and supportive solution for further growth. 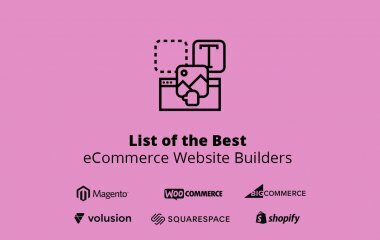 If you’re starting your online store and are looking around for the right platform for your needs, then look no further. After comparing coding, prices, flexibility, and customizability in both platforms, Magento 2 is a clear choice. It allows for total control over the user’s website and broadens the functionality with no limits. Since it’s great for any business, you should consider switching over to Magento 2 in 2018. If you need any consultation regarding Magento 2 Migration, we are ready to help you and answer all questions! Do you find this article useful? Please, let us know your opinion and rate the post! 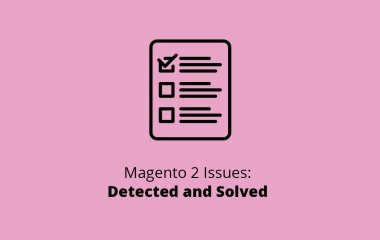 Learn about 15 Magento 2 Issues that we detected from the past year and solved them.